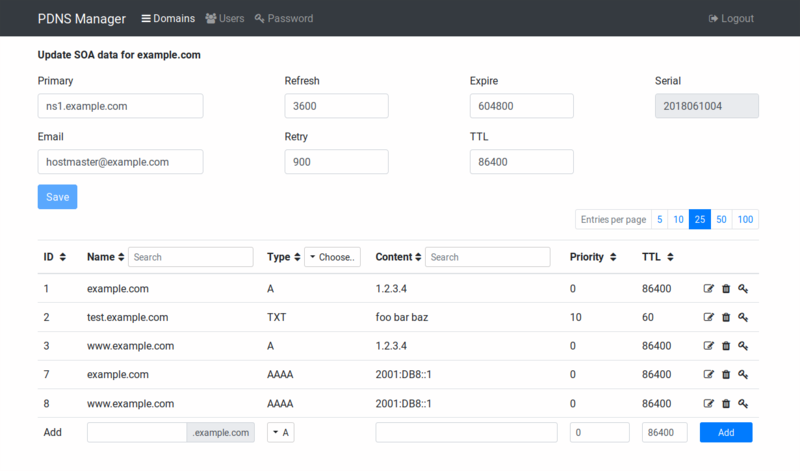 PDNS Manager is a simple yet powerful administration tool for the Powerdns authoritative nameserver. It supports master, native and slave zones. PDNS Manager was developed from scratch to achieve a user-friendly and pretty looking interface. PDNS Manager also features a powerful API to set records programmatically. This can be used not only for a dynamic DNS service but also to obtain certificates from Let's Encrypt via the dns-01 challenge. The Backend of PDNS Manager is written in PHP using Slimphp. The backend uses a MySQL or Maria DB database. The database is used by Powerdns through the pdns-backend-mysql. The Frontend is developed using Angular and Bootstrap. As PDNS Manager 2.0 is a complete rewrite, there are some steps required to upgrade an existing installation to version 2.0. See Upgrading from version 1.x.